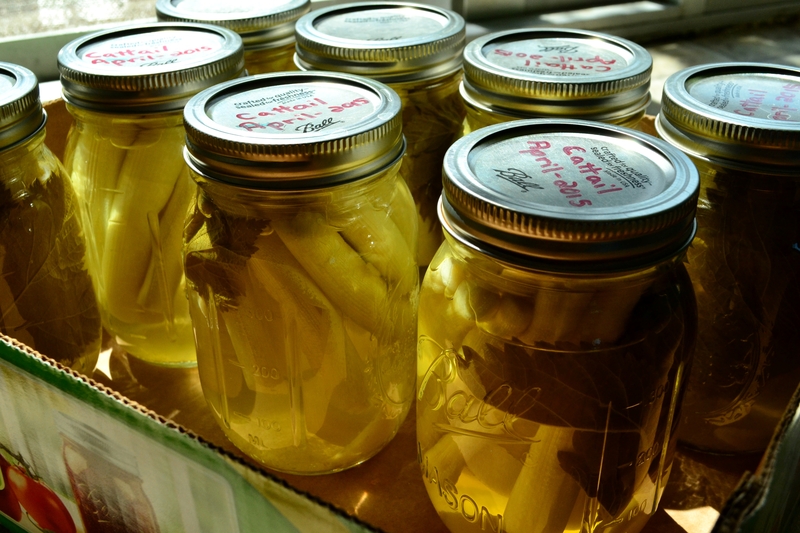 Today we take on the food preserving work of possibly North America’s most widely abundant wild edibles. 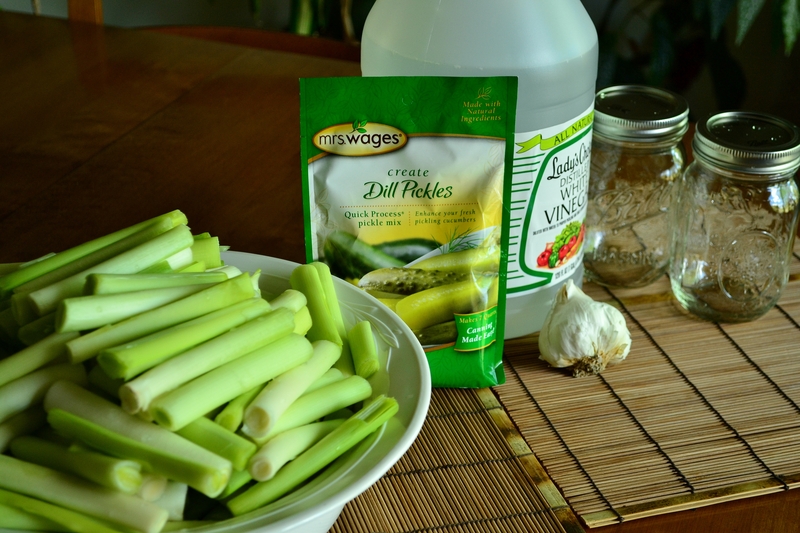 That’s right, were going to pickle ourselves some Cattails! No… not the feline, but none other than Typha latifolia. Before we hit the kitchen our culinary experience will begin by our local wetlands, where we find Cattail growing at the perfect stage to be harvested. After plucking the young plant from the base we clean the outer leaves by cutting them to length and removing the outer greens, exposing the white tender insides. Once enough has been collected to fill all 12 of our pint size mason jars ( a rough estimate, but about a grocery sack full ) we head back home to finish cleaning and cutting to jar length. Following the instructions, I add both the water and vinegar to a pot and bring to a slow boil. The seasoned salt is added and the mixture is allowed to boil just long enough for it to fully dissolve, then it’s removed from the heat. In the meantime, the mason jars/lids are washed and then sterilized by means of a boiling bath. The hot jars are carefully removed from the bath and placed on a clean table where we begin to add the ingredients. I begin by dropping a few cloves of garlic into the jar. Then I place a piece of Stinging Nettle or Thimbleberry shoot ( More or less for decorative purposes due to the lack of fresh Dill) into the side of the jar. 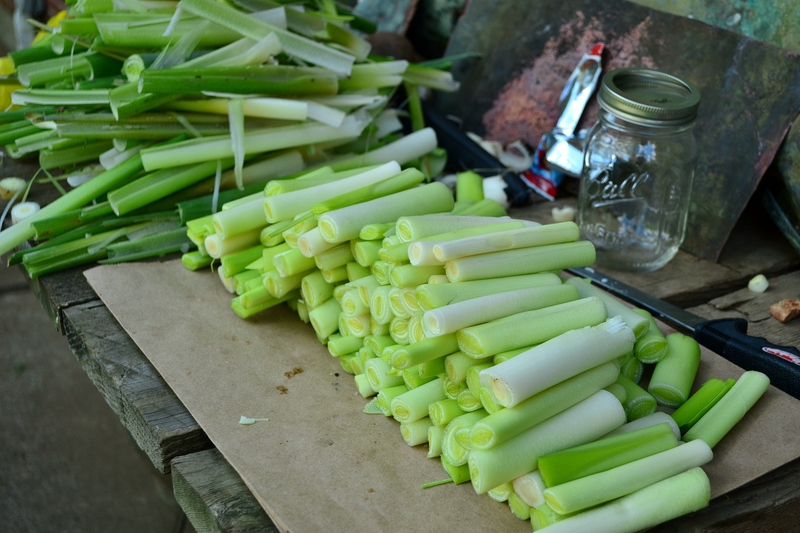 Carefully I slide in as many pieces of Cattail as I can, topping it off with a few smaller chunks. Now that the jar is packed I slowly pour in the hot salt brine leaving a shallow head space. Shaking and tapping I try to remove as many air bubbles as possible. The jar rim is then wiped off with a clean towel and the sterilized lids are placed on top. The ring is twisted on but only slightly snug. These jars are now ready to be boiled. After all the jars are placed in the pot, the water surface should only come about an inch above the jars. The pot is brought to a boil with lid on and a timer is set for 10 minutes. At the end of the 10 minutes the pot is removed from the heat and let to sit for another 5 minutes. Using a proper tool each jar is carefully removed from the hot water and set aside while they cool. Don’t forget to tighten the lids once removed from the boil! After 24 hours these pickles will be ready to eat! Be sure to write the date and type of pickle on the lids. This record will help remind you to enjoy them before “too” much time passes by. If you found this article useful, please help The Northwest Forager by hitting the Follow Button and sharing this article on your favorite social media. Your comments are always appreciated! I think you forgot to say to tighten the lid after they are out of the water. This is my first visit and will be back. Haha and I should hope that the conservation folk have more to worry about protecting than Cattail. Perhaps you could bribe them with your pickles??? Hi Denny. that’s a very exciting offer. May I first ask for which magazine? And with my pictures used, will I retain full rights?